The New York Times bestselling dramatic and never-before-told story of a secret FDR-approved American internment camp in Texas during World War II: “A must-read….The Train to Crystal City is compelling, thought-provoking, and impossible to put down” (Star-Tribune, Minneapolis). During World War II, trains delivered thousands of civilians from the United States and Latin America to Crystal City, Texas. The trains carried Japanese, German, and Italian immigrants and their American-born children. The only family internment camp during the war, Crystal City was the center of a government prisoner exchange program called “quiet passage.” Hundreds of prisoners in Crystal City were exchanged for other more ostensibly important Americans—diplomats, businessmen, soldiers, and missionaries—behind enemy lines in Japan and Germany. 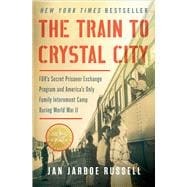 “In this quietly moving book” (The Boston Globe), Jan Jarboe Russell focuses on two American-born teenage girls, uncovering the details of their years spent in the camp; the struggles of their fathers; their families’ subsequent journeys to war-devastated Germany and Japan; and their years-long attempt to survive and return to the United States, transformed from incarcerated enemies to American loyalists. Their stories of day-to-day life at the camp, from the ten-foot high security fence to the armed guards, daily roll call, and censored mail, have never been told. Combining big-picture World War II history with a little-known event in American history, The Train to Crystal City reveals the war-time hysteria against the Japanese and Germans in America, the secrets of FDR’s tactics to rescue high-profile POWs in Germany and Japan, and above all, “is about identity, allegiance, and home, and the difficulty of determining the loyalties that lie in individual human hearts” (Texas Observer).